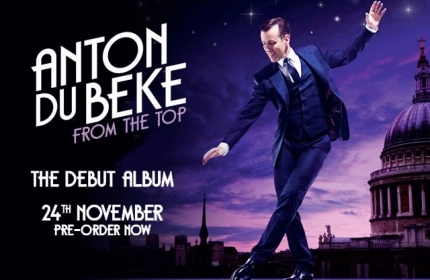 From The Top – Anton’s Debut Album! 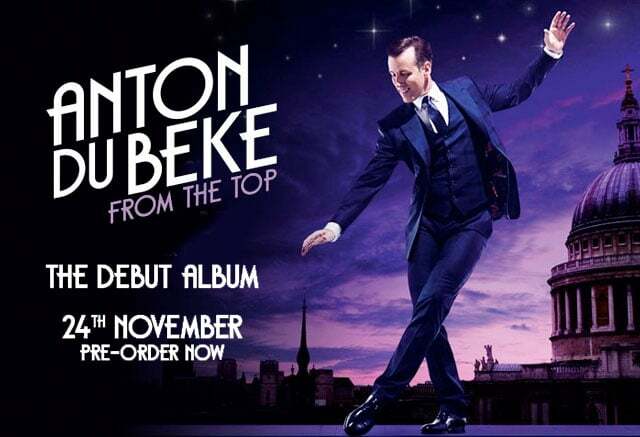 Strictly star and nation’s favourite Anton Du Beke will release his much-anticipated debut album ‘From The Top’ on Polydor… and you could win a dance lesson with him too! A key player in the phenomenon that brought dancing not only back in favour, but onto primetime ratings-topping television, Du Beke has being entertaining 11 million+ audiences since 2004. Having wowed fans on his national sold-out tours with his singing and dancing routines, word of his debut album has been met with huge excitement. Recorded mainly at The British Grove studios, the album features some old classics such as Putting on The Ritz and Me & My Shadow (a track that Du Beke originally performed with Bruce Forsyth on Strictly Series 6), plus a new twist on big hitter I Bet That You Look Good On The Dancefloor plus original song Nothing But Love. Win a lesson with Anton! Email [email protected] with proof of your #FromTheTop pre-order on Amazon to enter! No purchase necessary – click here for more information. Week 4 and just 13 couples remain – unlucky for one, and after the nerves and low scores for our Rumba, Ruth and I knew we were very much on the back foot as, tickets in hand for a Venetian masquerade ball, we began to prepare for our Tango! With Ruth’s busy TV schedule, we had our work cut out to master this dance in good time for the weekend. Like the Rumba, it’s a distinctive dance with particular frame, shaping, footwork, attack and characterisation to practise and perfect. But from the outset, I had an inkling that this was going to be Ruth’s dance: last weekend had brought about a change in her attitude, her determination, and her confidence… and a driven look in her eye. Applying this to the Tango – the timing couldn’t be more perfect. Training went well all week: Ruth was loving the dance, and embodying the powerful, dominant female character required. She also began to experience the real thrill when steps flow – no longer looking down at her feet, she was able to move like a dancer. As the week progressed and our routine became more polished, I felt we could well be on to a winner! Ruth was magnificent! Absolutely faultless – not even a foot wrong! Our tango was tremendous! It would appear, with hindsight, that Ruth was unknowingly exercising one of the traits of a true professional: holding something in reserve for the main show. Who knew?! Emerging from behind a mask in the Venice Carnivale in the smoky early morning light after a masked ball, the ballroom was our very own Piazza San Marco. As the pulsing strings from Karl Jenkins’ Allegretto drifted through the air, we were driven towards each other, interlocking, casting aside our masks and taking to the floor under the lights of the Rialto bridge. Simply spellbinding – and with that tremendous staging, we couldn’t help but get into the character of the dance, embrace the drama and ‘passione’… and well and truly nail it! All helped, no doubt, by my wonderful velvet suit — worn especially for the event as I had an inkling this was going to be a goodie! It really was Ruth’s dance – she performed it just brilliantly and I’m sure you could tell I was over the moon as the routine ended and we took our places ready for the critique. We could barely believe our ears. Craig went first with overwhelming positivity (for him! ): “That’s a bit more like it! … Pleased you’re making progress!” What a turnaround from last week – and from that starting point we hoped the rest would all be positive too. Darcey commented on Ruth’s determination, as well as some looseness in the shoulders, but said she felt she really was “in the moment”. Shirley delivered yet more praise: “100% improvement from last week!” She also spotted Ruth’s ‘fallaway whisk’ and said it was “amazing” – it’s always lovely to hear when those details are recognised. Even Bruno: “I can’t believe it – you didn’t go wrong once!” What simply glorious feedback… and what a huge relief! When the scores came, sixes all round, we were both thrilled to bits. I was especially thrilled for Ruth as the comments, and 24-point total will have been a real boost for her – and a real sign that she’s improving. And not just that, we weren’t at the bottom of the leaderboard at the end of the night! Result! Back to the competition, and thirteen couples were frozen under the spotlights waiting to hear their fate. And, all thanks to Ruth’s wonderful performance – plus your invaluable votes – we were through to next week! Hurrah – our Tango was a triumph!! Then came the sad moment that one of our celebrities would be going home. 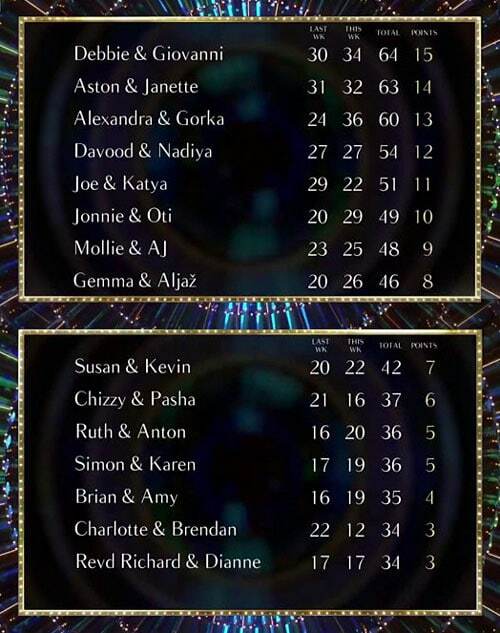 This week’s dreaded dance-off was between Davood & Nadiya, and Brendan & Charlotte – a surprise result for Davood who finished 4 places higher than us on the main show’s leaderboard. It just goes to show how unpredictable the final scores can be – and of course, how essential your votes are! Both couples danced so very well, but one had to leave the competition and, unanimously, the judges saved Davood & Nadiya. Huge commiserations to Charlotte & Brendan – we’re all still marvelling how Charlotte managed to find the time to rehearse with her incredibly early starts and young family too. She’s very much missed already. I should also congratulate Alex & Gorka on their incredible performance: scoring 39 points week 4, that’s something quite remarkable! Credit where credit’s due, they’re a wonderful couple to watch! For Ruth and me, it’s back to training with even more focus and determination to ensure we keep improving week on week. Things are really hotting up… not least as we’ve got the Samba! After nailing the Charleston (Shirley’s words! ), we had high hopes for a killer Rumba with our Bond-themed dance. Ah the Rumba, the dance of love – the first of the series, too – no pressure! A notoriously difficult dance, and especially for a non-dancer so early in the competition – it really does require such a degree of confidence and technique, the steps themselves having to be second nature to allow the dance to be truly ‘performed’. All of which is a tall order, week three. I couldn’t be more proud of Ruth’s dedication and determination during last week’s training, and I personally was absolutely delighted with our performance; more than that, I thoroughly enjoyed it, too. In the cool blue light, bedecked in jewels and sparkles, Ruth was a diamanté vision as our routine began – bearing a striking resemblance to Kim Basinger with those long blonde locks – quite the leading lady, very much the Bond Girl, and simply stunning! As the music began with that wonderful, iconic melody, those fabulous lyrics, I made my entrance with the panache of Anton Du Bond. I struck a pose, and thus we began our sensuous Rumba, caressing the dance floor under a cloud of dry ice, focusing on hip action and flowing continuous motion all the while embracing the styling and drama from a Bond movie opening sequence. The audience certainly seemed to approve, and we felt worthy holders of our licences to thrill… but the judges’ comments made us feel like we should be turning them in! Tess asked Bruno if he was shaken or stirred, which he replied “I think I was frozen!” He went on to explain how he felt Ruth’s hips needed defrosting, that the dance needed more heat and that it wasn’t her best. Things weren’t going to improve with Craig who said the rumba walks were “very stilted, and lacked hip action,” and also that it was as though Ruth was wearing a mask, hiding any acting – Ruth quietly replied that she was indeed… to hide the terror! It was at this point I felt compelled to chip in as the feedback wasn’t feeling particularly constructive. I, a gentleman of a certain age, certainly did feel stirred by proceedings… I had a fabulous time and thoroughly enjoyed the performance with my first class Bond Girl, and it needed to be said! Darcey then continued on a brighter note: “This look is to die for – you look absolutely fabulous.” She went on to agree with Bruno and Craig on technical points around resistance, balance, transitions and so forth. Both Darcey and Shirley referenced eye contact: that if Ruth had held my gaze it would have helped with the sensuality of the dance, as well as her balance. Good feedback there, and that’s something which I’m sure will come with confidence. (It’s most likely my sparkly jacket proved such a dazzling distraction she had to concentrate hard on looking away!) Shirley also acknowledged that the Rumba is an extremely difficult dance (hear hear) and I’m pleased everyone could properly appreciate how hard Ruth had worked to be able to perform it. The scores, however, gave no ‘Quantum Of Solace’: mere 3s from Craig and Shirley, a 4 from Bruno, and a most welcome 5 from Darcey. Total: 15. Oh dear… it almost knocked ‘The Living Daylights’ out of us – we were certainly left shaken! 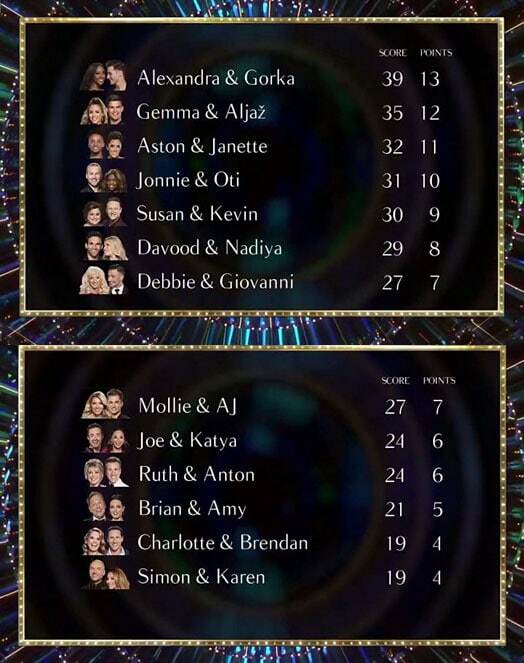 Such a shame that our scores took a dive after the improvement we made from week 1 to week 2; ah, the Strictly rollercoaster! Finding ourselves second from the bottom of the leaderboard, just one point above the Rev’d Richard and his Flash Gordon Paso, you can imagine our nerves during the results show as we feared the worst. Even the wonderment of the ‘La La Land’ themed Pro dance (wasn’t it tremendous?!) couldn’t quell our nerves as we waited so see if we would survive to ‘Die Another Day’. And so, you can imagine our utter relief, when our names were called out as being through to next week. My goodness me, it always comes as a surprise; when you’re under those lights with that fateful music in the background, you can’t help but fear the worst, and this week was no exception! This week’s dance off was between Simon & Karen with their Toy Story inspired Quickstep and Reverend Richard & Dianne with their Flash Gordon Paso. 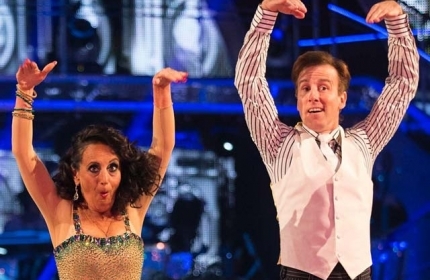 (The likes of which could only happen on Strictly!) Despite valiant efforts and wonderfully entertaining performances from both couples, one had to leave the competition. The judges were unanimous in saving Simon, and we all bade a very heartfelt farewell to our resident Reverend. What a wonderfully dry sense of humour – he had us all in stitches! He did confess that he knew he couldn’t dance… but after giving us such heavenly performances these past weeks, I say ‘Never Say Never’! Thank you all so very much, once again, for voting us through. We couldn’t have done it without you, and I’m just so thrilled that Ruth will have the opportunity to put this week behind her, to get this most difficult of dances under her belt, and to move forward with the next one. I do so hope her true potential is realised! Until then, it’s back to training – and no time like the present, after all, ‘You Only Live Twice’! 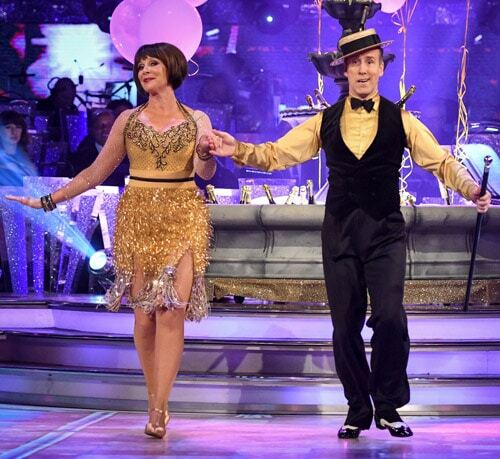 From the Waltz to the Charleston in one week – and (spoiler alert!) with a 4 point improvement – Ruth’s really shaping up to be a very willing and able student and I think we’re on track for some classy performances in the weeks to come! Meanwhile, how about our Great Gatsby inspired cheeky Charleston last Saturday? What a ‘roaring twenties’ triumph! High drama late in the week though as Ruth pulled a hamstring and was put on bedrest by the Strictly Physio… we missed one of our studio rehearsals, but as I’m sure you’ll agree, you’d never know from her sterling performance! She really was channelling the twenties – my heroine! Fountains and champagne flutes and feathers for the flappers – all fabulous and very F Scott Fitzgerald as Ruth made her entrance in a wonderful tasseled dress and I with my dapper boater and cane! Hats off to Ruth for her solo spot at the top of the routine (especially after her feeling rooted to the spot with leaden legs at the start of last week’s dance) – what a transformation! I knew that her confidence would grow once week one was under her belt, and there’s the proof! As Dave Arch and his wonderful band struck up ‘The Charleston’ by Bob Wilson and his Varsity Rhythm Boys, we got into character and flew into action. With so much content to squeeze into our routine, we needed to be in time, in sync, and in the right positions to keep the flow from one sequence to the next. Honestly, the level of concentration and coordination involved is not to be underestimated, let alone managing the tempo changes… and facial expressions! What tremendous fun, and my goodness, what sensational swivels! As the music drew to a close and we reached our final places right on time, we were both overjoyed at the eruption of applause and the standing ovation from the audience. Magnificent, I thought, as we soaked it up and made our way over to the Judges. Our scores ranged from a three from Craig, to sixes from both Shirley and Bruno and a five from Darcey giving a total 20. A four point improvement from our 16 last week is tremendous – it means we’re well and truly on the right track! This score, combined with last week’s 16, rocketed us up the leaderboard to joint 11th place alongside Simon and Karen. Apparently Craig had told Ruth, “Darling, it’s the bottom everybody talks about,” but I say that’s no reason to stay there, this is a competition after all! By the time of the results show, I’m sure all our new celebrities were on tenterhooks, dreading the first elimination of the series. Ruth was no exception… but you can see just how relieved we were when our names were called out as being safe. Thank you all so much for voting, I’m sure as the weeks progress and the competition gets tighter we’ll be counting on your votes all the more – so do please keep at it each week! It wasn’t such good news for Brian and Amy, and Chizzy and Pasha. Both couples were to face each other in the dreaded dance-off: one last chance to perform their routines before the Judges in the hopes of being voted through to next week’s show. I must say I thought they both performed magnificently, especially given the short amount of training these non-dancers had had… and they both danced better than they had in the main show – they really gave it their all. It was clearly a difficult decision for the Judges as there was some difference of opinion, but in the end Shirley as Head Judge made the final call and voted Brian and Amy through, eliminating Chizzy and Pasha. Chizzy was clearly so very disappointed – all of us felt for her, and for Pasha too of course: being first to go is never easy. 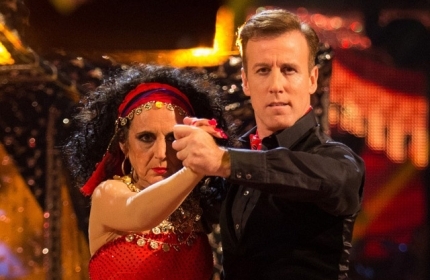 We’re all missing Chizzy terrible already – such a personality – I do so hope she keeps dancing. Back to training for Ruth and me though: this coming Saturday is ‘Movie Week’! I’ll be James Bond, and Ruth my Bond Girl – we’ve the Rumba… to ‘Diamonds Are Forever’. True class! I’ve got a licence to thrill and you’ll have the best seats in the house. So tune in on Saturday at 6:35pm, and I’ll see you on the dance floor! After the exhilaration of the Red Carpet Event and the series Launch Show, it must come as quite a shock to the celebrities each year as we go straight into long arduous days of intensive training to make our partners performance-ready. This year even more so, with just two weeks for them to find their feet, grasp the basics, learn the first dance… and steel their nerves! Ruth, I have to say, has been a model student, everything I could have wished for: tireless enthusiasm, the drive of a perfectionist, and crucially a very good sense of humour! That’s not so say the Waltz hasn’t presented hurdles for Ruth to overcome – you’ll have seen from the VT that she had ‘looking issues’ – either at her feet, or me! I had to insist that she didn’t gaze into my eyes, but looked away instead – I can’t blame her though, magnetism is a hard force to fight! 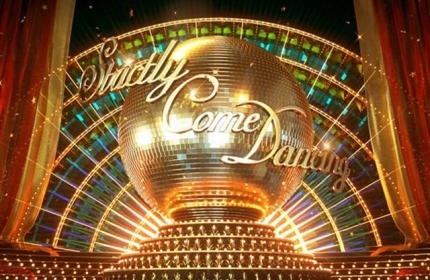 This show was perhaps one of the longest in Strictly history with 15 couples dancing all on one night, rather than splitting the initial group across Saturday and Sunday evenings. Being twelfth in the running order meant that we had an agonisingly long wait… and that’s when nerves often start to kick in. Ruth insisted she’d forgotten all her steps; all I could do was insist otherwise! At last, our names were called, the lights dimmed, and flutes and strings from Dave Arch’s wonderful band sang sweetly over the applause: it was now or never. Thus began a beautiful moment in dance: I (dressed in my best suit and tie, and all fresh from the barbers) presented myself to Ruth, and she, seated coquettishly there on the posh settee, took my hands and rose to her feet; we embraced… and were off! Our first steps on a magical journey together. Graceful, elegant, Ruth was simply resplendent in her beautiful dress rippling and shimmering as we traversed the dance floor in a lilting three-four time. 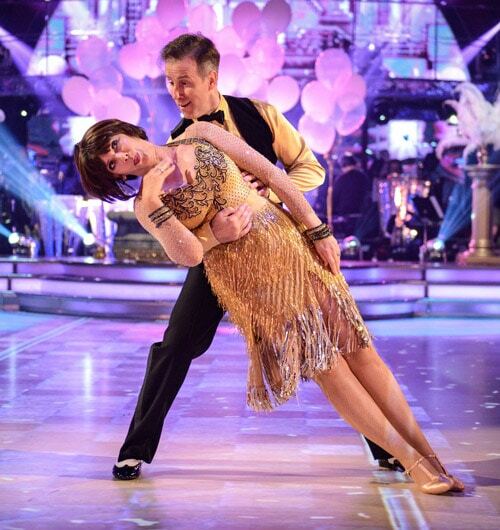 I thought she performed marvellously – I couldn’t be more proud of her for dancing so well. Granted, there were a few uncharted improvised moments, only to be expected with the first week’s dance – but like I said afterwards: ‘She didn’t go wrong, she just went different!’ Ruth in fact admitted it was the most nervous she’d been in 30 years of live television, but each week I’m sure it will get easier and her confidence will soar in accord. Truth be told, I think we’re a particularly well-suited couple with great potential in the competition! Round and round we spun to reach a grand finale with fireworks – no expense spared for what, to my mind, was a simply gorgeous performance for our dancefloor debut! The applause was loud and wonderful to hear, especially for Ruth. Then hearing Eamonn say how proud he was of her was timely reassurance to her as we took our places next to Tess, bracing ourselves for the verdict from the Judges. Darcey began by noting the romance in the performance, Ruth’s quality and grace, and that she had a wonderful aura about her. Quite so. She said there was work to do on posture, but what sold it was her smile. Marvellous! Next up was our new Head Judge, Shirley: “What struck me the most was how you made me feel, you’re definitely a lady, very elegant.” Another first rate appraisal. She said she spotted a few off-time moments, but that Ruth was very graceful nonetheless. Something I shan’t forget in a hurry was the curious analogy of her hand placement being like a butterfly – though not one with ‘concrete boots’ – how fabulous! With constructive critique like that, Shirley gets my vote! Some things, however, never change… Bruno: “A picture of loveliness and wholesome goodness… it’s just that the feet have a mind of their own!” He too picked up on Ruth’s posture, insisting that she should maintain her frame and not hang on to me. For a first dance I have no problem with that – after all, I can’t blame her for hanging on to me, being all suited and booted and smart! The rise… and fall of the dance was in sync with the critiques by the time we reached Craig: “It really was the stumble and grab dance, hope you can do better next week, darling.” Ah, enough said! The scores, I feel, could have been a tad better: a mere 3 from Craig, 4s from both Darcey and Shirley, and a welcome 5 from Bruno for a total 16. Sadly, by the end of the show, this placed us joint bottom of the leaderboard along with Brian Conley and his partner Amy. A very good place to start week 2 though – after all, the only way is up! As for our Charleston… It’s so fast I’ve had to undo my top button in rehearsals. That’s all I’m saying… so make sure you tune in on Saturday night! Remember, one couple will leave the competition this weekend – hopefully an improved score will lift us out of the danger zone and keep us from the dreaded dance-off, but your votes, as always, will truly count! 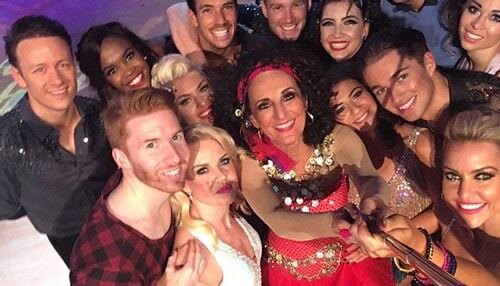 Strictly Series 15… Let’s Dance! It’s that magical time of year again when dance fever takes the nation into hold!… Strictly Come Dancing is back – and for its fifteenth series, no less! Seeing how it’s grown from one year to the next, this new series is surely set to be the very best yet… So cue music, take your partners, and Let’s Dance! As is customary at the start of each series of Strictly, I can’t help wondering if perhaps this year will be my lucky year. Will I finally get to hold that ever-elusive Glitterball aloft at the Grand Final? I’d like to say I’ve worked out a strategy after 14 series… but performing live under professional scrutiny with non-dancer partners always has its moments and things may not always go quite to plan! One must strive for excellence… and improvise where necessary! Rehearsals for us Professional Dancers began early August – lots of familiar faces from our extended Strictly Family back together again as we started learning our Pro routines – as well as our new dancers too: Dianne, Nadiya and Amy – they’ll certainly put three of our celebrities through their paces, of that I’m sure! Very talented dancers indeed, so let’s give them a very warm welcome! Soon enough, we met with this series’ celebrity line-up at our first secret rehearsal – and what a multi-talented all-star cast emerged from behind the red curtain! The Saturdays’ Mollie King, Eastenders’ Davood Ghadani, ‘Loose Woman’ (dare I say!) Ruth Langsford, actress Gemma Atkinson, the most Reverend Richard Coles, Holby City’s Joe McFadden, celebrity chef Simon Rimmer, singer Aston Merrygold of JLS fame, the hilarious Susan Calman, all-rounder Brian Conley, GMB presenter Charlotte Hawkins, Chizzy Akudolu of Holby City fame, the wonderful Debbie McGee, paralympic champion sprinter Jonnie Peacock, and last but by no means least, the inimitable Alexandra Burke. 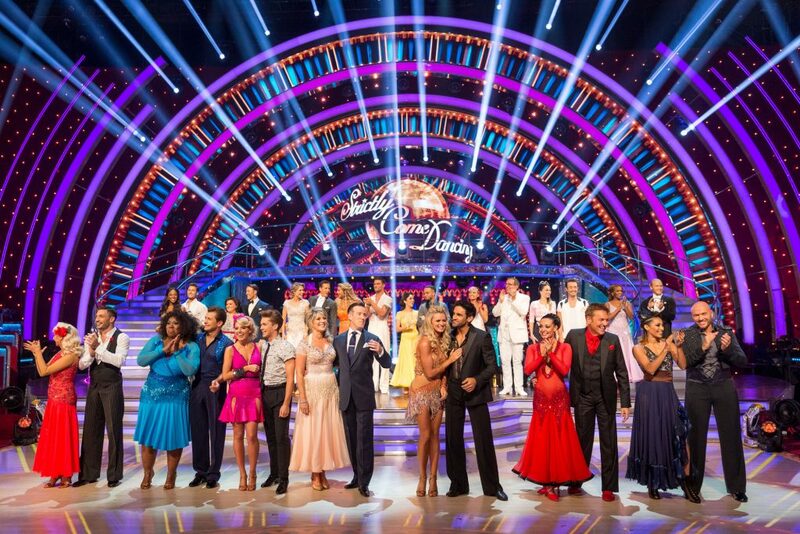 What an incredible line-up, and each and every one of them fizzing with excitement as we all learned the steps for the first Group Dance! 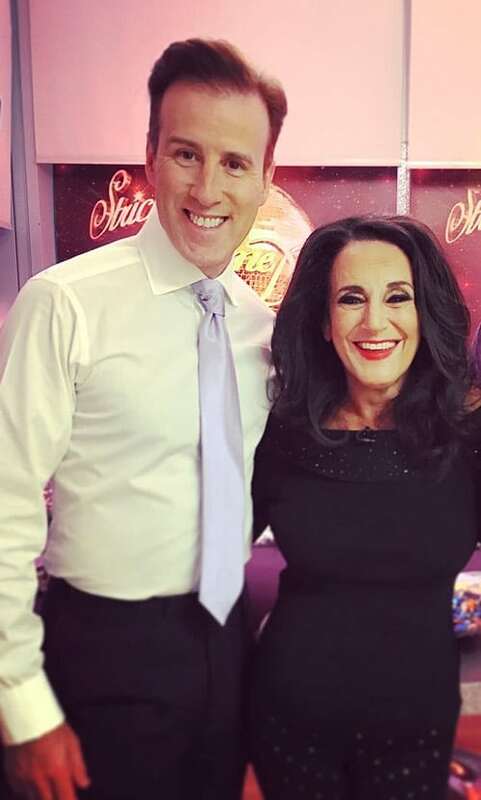 There’s yet another new face to the Strictly family this season with our brand new head judge, the very lovely ‘Queen of Latin’ Shirley Ballas. Whilst it won’t be the same without longstanding Len Goodman, head judge from the very start (though you can still see him on BBC1’s new gameshow ‘Partners In Rhyme‘ – and yours truly takes part in the first episode! )… I’m thrilled that our new Head Judge has as sharp an eye for the details, and is equally a stickler for the rules. To my great delight, as I’m sure you could tell during the Launch Show, my partner this time is none other than the aforementioned ‘Loose Woman’ and ray of sunshine on ‘This Morning’, it’s Ruth Langsford! I must say, we’re a perfect match – in both height and humour – and eight days into training I’m already seeing glimmers of a dancer in the making, too. Ruth will be one to watch, mark my words! …In fact, I’ve gone so far as to say she’s an A A A Star pupil! Our dancefloor debut this coming Saturday night is the Waltz, to the beautiful Rodgers & Hammerstein classic from South Pacific: ‘This Nearly Was Mine’. Do you think there’s a subliminal reference to the Glitterball in there? Meanwhile, we’ve posture to perfect, framing to refine, let alone steps to learn! 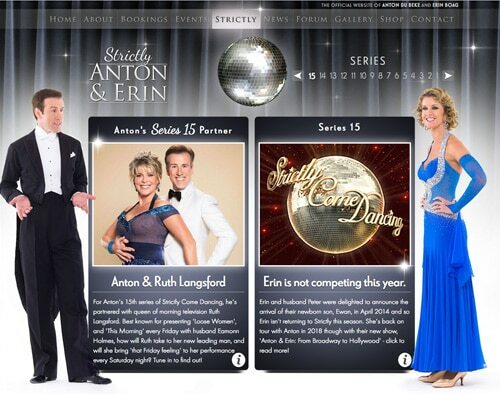 Don’t forget to keep tabs on the Strictly page over at AntonAndErin.com – our dance card is ready for action and each week I’ll update it with dances and scores to see how we’re faring. 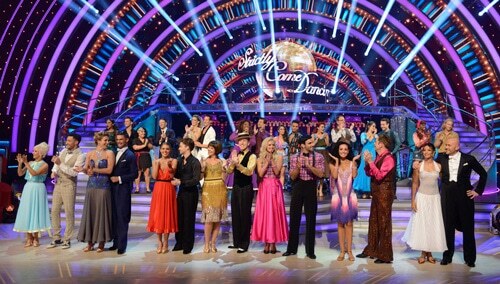 You can look back through all past 14 series of Strictly there too – quite a trip down memory lane! For our day-by-day progress, you can follow me on Twitter, Facebook and Instagram, and Ruth on Twitter too so you can track our every move! Your support and message of encouragement really do mean a lot, and I never forget that it’s your votes each year that help keep me and my partner in the competition week on week. Well my loves, back to training! I’m so looking forward to stepping out for the first time with Ruth this coming Saturday night. BBC1, 6:25pm – see you on the dance floor! 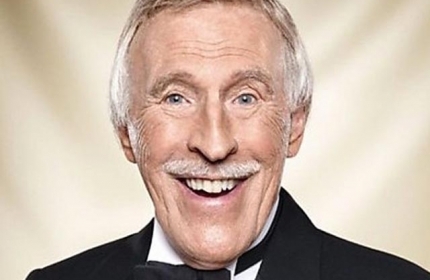 I do hope you saw the incredibly moving tribute to Sir Bruce Forsyth during the Launch Show for the new series of Strictly – such a fitting and poignant homage to a true gentleman who dedicated his life to entertainment and bringing joy. It’s included at the top of this post – do watch, and enjoy. For me personally, Brucie was a true inspiration, an all-time hero, but most of all, a very dear friend. A part of my heart will always be broken. I’d like to share a very special memory of mine, when I was Brucie’s sidekick in ‘Me And My Shadow’ – it’s impossible to watch without smiling. What a legend. He’ll always be ‘my favourite’. 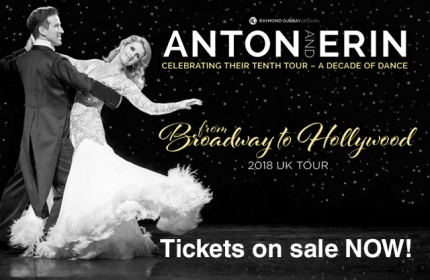 From Broadway to Hollywood – our 2018 Tour! Dance fever is about to grip the nation once again as we roll out the red carpet and raise the curtain tonight at 7pm, BBC1 for a very exciting Launch Show to the 15th series of Strictly! But there’s more… Erin and I are also thrilled and excited to announce our new Tour for 2018: ‘From Broadway to Hollywood’! This nationwide tour is particularly special for us as it’ll be our tenth tour – celebrating ‘a decade in dance’ – and there’ll be no holds barred: we’ll be showcasing the very best of the repertoire and simply can’t wait to share it with you! Some of those numbers include: “Cry Me a River”, “Mr Bojangles”, “Downtown”, “New York, New York”, “Couple of Swells” and of course “Libertango”… and with Richard Balcombe leading the London Concert Orchestra, Lance Ellington adding his dulcet vocals, plus our marvellous ensemble dancers… it promises to be an unmissable experience! ‘From Broadway to Hollywood’ runs from the 19th January to the 18th March 2018 – 35 performances in all, for which you’ll find full details of dates, venues and how to book over at Raymond Gubbay’s website. Erin and I are so looking forward to seeing you in the audience! Spirits were certainly high before the start of the show last Saturday, confidence too, each couple starting to build on their performances week-on-week. There’s always a ‘bedding-in’ period whilst the celebrities find their feet, so to speak, Lesley included – especially after the success of the previous weekend’s Charleston – we were both on a high, and ready to channel that into the high drama of the Tango. The weekend delivered drama indeed, more than we’d anticipated… and more than either of us saw in the tea leaves, tarot cards or crystal ball which were all used to set the scene for the dance. ‘Whatever Lola Wants’ was our tune to Tango to – modern but with those traditional overtones of the bandoneon sharing the melody with, and winding around, the vocals. Lesley, as Madame Lola, was at her table gazing into the crystal ball as I arrived for my reading. Whatever premonition she saw in the crystal had her leaping out of her seat, over the table, and falling from on high into my arms. My goodness, what an opener! Now, the Tango is a particularly tricky dance for the celebrities to master – the sharp moves and staccato rhythms are all at odds with the flow and motion of the other ‘swing’ dances, and as Lesley herself pointed out in interviews, to maintain a ‘passionate detachment’ is incredibly difficult to do! (Not least when in my arms, I’m sure!) Technically, it becomes a dance of contradictions and may explain why three of the four departures so far this series have been on the Tango. That said, Lesley performed a very good tango indeed – I was thrilled to bits. Our dance was packed full of content – a great deal for her to learn and deliver, plus drama – she maintained great characterisation throughout, all the while conveying a strong sense of the key elements of the dance. 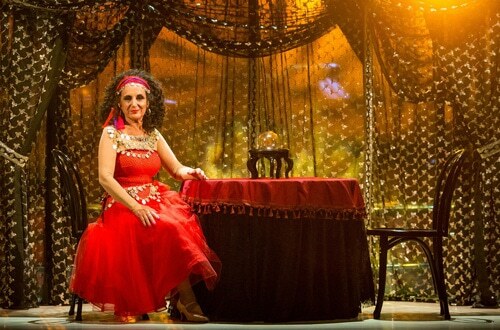 In a finalé almost as dramatic as the opening, I smash the crystal ball to the floor – clearly no longer needed as our dance had brought Madame Lola’s vision to life! The audience were on their feet. Brava! I had reservations that our upward trajectory score-wise was about to take a dive, and my fears were borne out with the scores. A five from Craig, sixes from Darcey and Bruno, but a good ‘ol seven from Len. Total: 24. 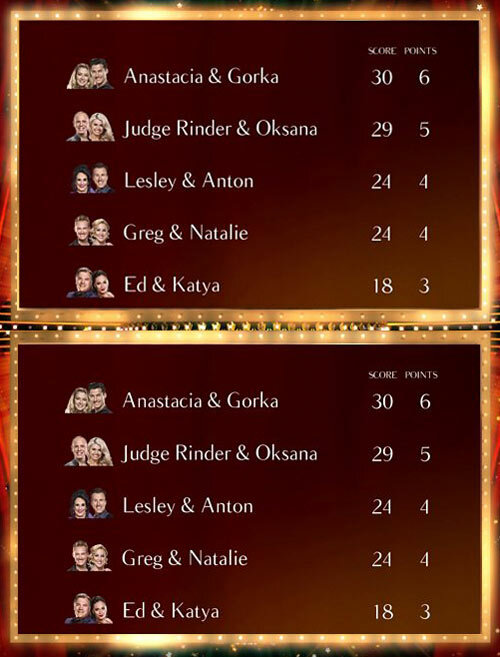 As the evening’s dances progressed and the scores tallied up, the leaderboard wasn’t looking as rosy for us as last week’s: we were close to the bottom, joint with Greg & Natalie, just above Ed & Katya. Precarious indeed. Our nerves didn’t abate and despite keeping everything crossed, the Sunday night results show was to bring the news neither of us wanted to hear. Our names were announced as the first couple to face the dreaded dance-off. When we learned in the second half that we’d be dancing against the wonderful Daisy & Aljaz, I think there was a tacit understanding that this might be our last Tango on Strictly. Undaunted, we approached the challenge with true gusto and danced our dance as if it really were the last dance – no holding back, and giving it everything. I’m quite sure Lesley in fact relished the opportunity to have another go with the Judges’ feedback fresh in her mind – ever the perfectionist! 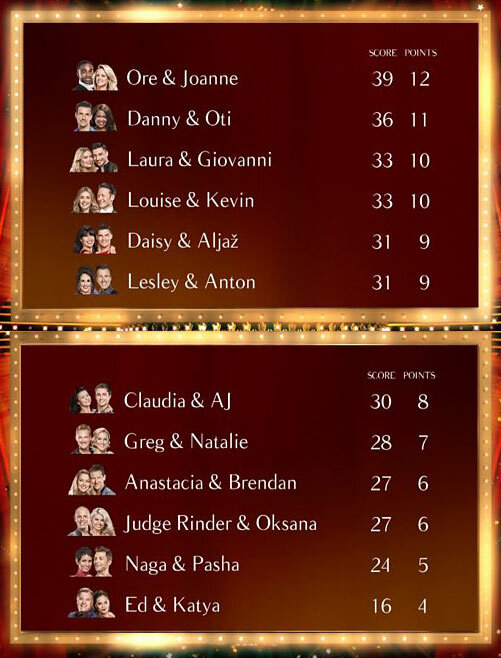 But alas, our best wasn’t quite enough against our worthy rivals with their fabulous and inventive Charleston, and the Judges were unanimous in their decision to save Daisy & Aljaz, ending our Strictly journey there at week 5. As Lesley and I went over for our final words with Tess, the audience were on their feet and we knew we were going out on a high. 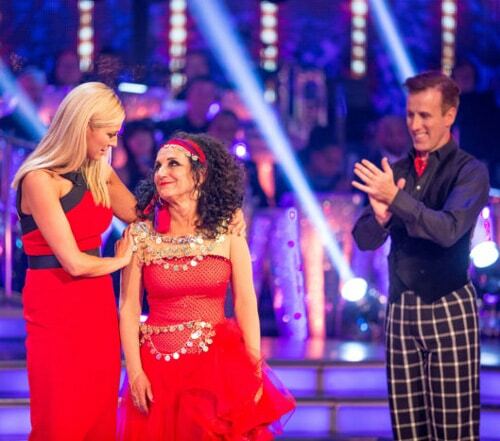 Lesley was so very kind when she said her Strictly highlight was working with me and us learning a new dance each week. We really did laugh during our time together – it’s been such an uplifting series! I said that Lesley had pushed my boundaries too – quite so – I was blessed with a partner who was already a performer, who was no stranger to fast-paced learning and who knew how to face the nerves and stage-fright of filming live television. With ticks in all those boxes, I was able to increase the content in each week’s dance knowing Lesley would be more than capable of delivering the performance itself. I must also mention her remarkable energy, flexibility and enthusiasm – my goodness me – she’s a real life dynamo! And whilst it wouldn’t really be proper of me to mention a lady’s age… I think we should all marvel at the all-round ability of this utterly inspirational 71-year-old. Hats off… Round of applause… Standing ovation! Lesley, you’re a superstar. Our Strictly time together has been a real and rare treat, I simply couldn’t have wished for a more fabulous partner. You have been a pleasure to work with and simply joyous to dance with. And as the programme drew to a close, I scooped my partner up in a fireman’s lift and we took to the floor for our Last Dance. And so, my loves, here ends my Strictly 2016 instalments. Lesley and I had a jolly good run at the glitter ball, and I think we surprised a few people too at how good our partnership turned out to be! But alas, all good things must come to an end and we bid a sad farewell to this year’s competition. 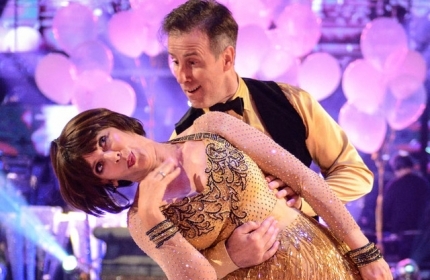 Huge good luck to all the other couples – there’ll be some tremendous entertainment in store over the coming weeks no doubt as the competition gets even hotter – and I look forward to watching the best dancer lift that ever elusive glitter ball in the Strictly 2016 Grand Final. And lastly, but by no means least, thank you all so very much for your continued support this series – it’s kept us in the competition all the way to week 5 and it’s meant the world to Lesley and me. Truly, it has. From ‘Birds of a Feather’ rehearsals, to soaring as my Maltese Falcon, Lesley truly took flight this week! As many of you will already know, Lesley is recording a Christmas Special of the hit show ‘Birds of a Feather’ at the moment, and last week, as if our combined schedule wasn’t hectic enough, the ‘Birds’ had to film on location… in Malta! A hardship indeed, but I of course had to join them… after all, we had a Charleston to learn! Now, admittedly, we couldn’t be dancing all the time and though there were delightful amenities and facilities all on hand… rest assured, whilst Lesley was filming, I was thoroughly occupied with creating and refining the choreography! Even despite Lesley’s gruelling schedule, the warmer climes and change of scene were in themselves energising, and our rehearsals went particularly well. Heading back to the UK with a spring in our step, excitement was also building as Friday was Lesley’s birthday and the wonderful It Takes Two team surprised her with a fabulous cake and balloon – both with my face on! Remarkable! Lesley roared with laughter, as did I! It was the perfect end to a perfect week… but would the celebratory mood continue through the weekend? The Charleston is fabulous to perform – full of fun, it’s frenetic and fizzing with energy – and we had a blinder of a dance lined up! “Won’t you Charleston With Me” from Sandie Wilson’s musical, “The Boy Friend”, was a number set in the roaring ’20s in a villa on the French Riviera. I was Bobbie and Lesley was Maisie, both dressed to the nines with tassels and spats – the works! The music started, I leapt down to the ballroom floor from the staircase, and with the delivery of the opening line, Lesley leapt to her feet, and we were off! And for a minute and a half, we didn’t stop! What a dance! Lesley was absolutely remarkable. The pace, the precision… the flicks, kicks, characterisation and control… the synchronised steps, the slapstick… not to mention the swivel! My goodness me, Lesley gave a sensational performance! As we caught our breath, we realised the audience were on their feet – tremendous!… The judges were brimming with enthusiasm too! Lesley is simply a dream partner – a joy to dance with and I – like the judges – continue to marvel at her energy, concentration and stamina! The scores were in: a 7 from Craig and 8s each from Darcey, Len and Bruno. We were both over the moon to have totted up 31, including our first 8s in the competition… and most importantly an increase over last week with our highest score to date. 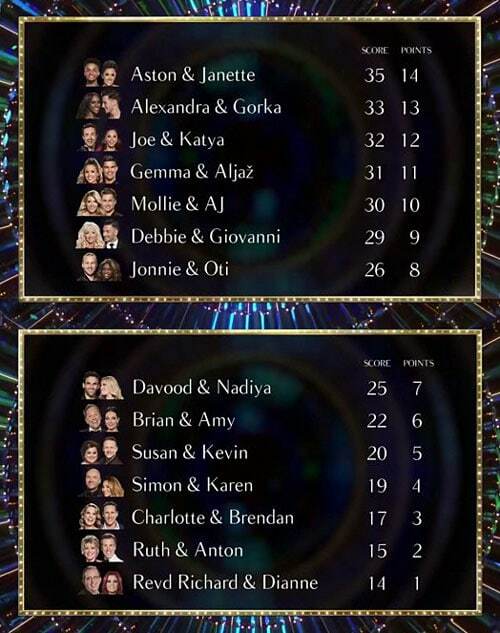 As for the leaderboard, by the end of the show, for the very first week, we were on the upper half! Hurrah!! 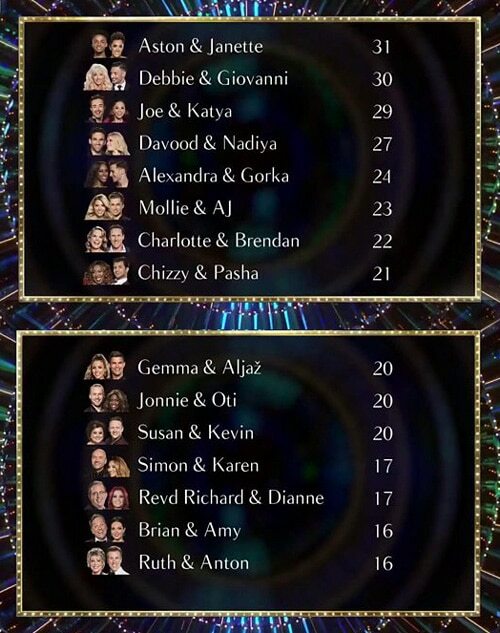 As always, it wasn’t until the Sunday night Results Show that our Strictly fate was revealed, and knowing how the leaderboard can turn on its head when combined with the public votes, we weren’t counting any chickens. But lo and behold, our names were called out first! Just the most wonderful feeling! We were safe… we’d made it through! There’s of course no escaping the rules to the show, so one couple was sadly destined to leave. This weekend’s dreaded dance-off pitched Naga & Pasha head-to-head against Anastacia & Brendan – a result none of us could have predicted. After two very strong performances, both couples dancing with more confidence than they had in the main show, it was clearly no easy decision for the judges. But after a particularly good Rumba, Anastacia was saved, and we all had to say goodbye to Naga. Such a lovely contestant, and a promising dancer too – she’s very much missed by all already. Now, before I sign off this week, I should make special mention to the weekend’s Group Dance. Once again, a true spectacle and a feat of choreography, but I must say I found it particularly fulfilling to be able to demonstrate my wider repertoire!… ‘Busting my moves’ I believe you could say! Have a watch of the rehearsal video, and then the actual performance below. Enjoy! What a fantastic weekend, all round! And so to this weekend’s dance… it’s The Tango. Ah yes! And my word have we a dance in store for you! Until then, my loves, thank you all so much for your continued support… Lesley and I both appreciate it immensely! The Audiobook for One Enchanted Evening is now available! Six More Dates for my Book Signing Tour! One Enchanted Evening – Out Today! Week 2 – The Foxtrot… and AntonDuBekxit! ‘One Enchanted Evening’ — Sample Chapter Giveaway! Be on the Guest List! No content may be reproduced without prior written permission.